For the poor old SPX, it is beginning to look like death by a thousand cuts as it is taking so long to adjust. In its defence it has just had Thanksgiving and a half day Friday, so we are not worried yet as the zone has at least started to move and, more importantly, under these circumstances, activity is far higher than we would have expected. Don’t forget just how massive this expiry is, so producing a level anywhere above “poor” is going some the benchmark is already so high. We still anticipate the zone moving to 2695-2705, and quite frankly, the sooner the better, as already the ratios below this level are being undermined, but it does make for soggy support levels, which is not good for trading. Case in point, on Wednesday R2 was at 2670 and the intraday low was 2670.73, but today it is standing at 2645. 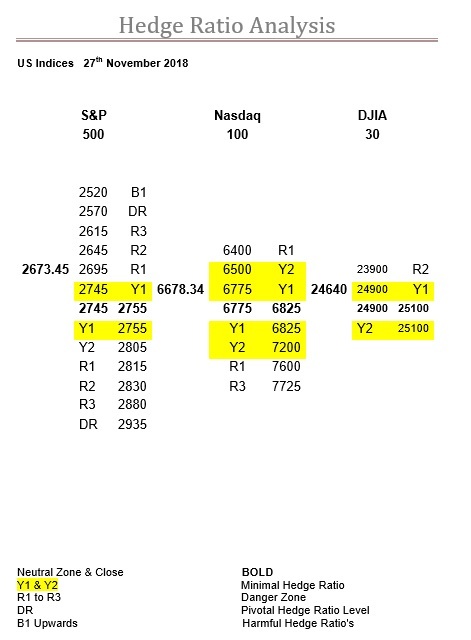 This means the low (2631.09) on the half day Friday was way below this level, but on the return to more normal market conditions on Monday the open was 2649.97 which was also the low. So, R2 is having an effect, it’s just a question of how far can one trust it? Our answer to that lies with the other indices, as we think its just about enough on its own, but to be really effective it needs a friend. The NDX is probably the most normal of the three, although rather ironically it started this expiry in the most abnormal position. However, it has strived to extricate itself and in doing so today we see that the zone has moved again, this time to 6775-6825. Nevertheless, this is a lot better than where it was back during the rollover, which was a rather staggering 500-points higher. The good news here was that on Tuesday the intraday low was 6442.36 which was a robust test of R1 then at 6475, and despite the other two on Friday either revisiting their lows or making a new one, here the low was 6524.55. Although, the NDX has now achieved a more natural looking expiry, there can be no disguising that the Y1 ratio bandwidth alone still stretches for 700-points, so the volatility is very far from being over. The DJX is a funny one this expiry, or to be more precise one we suspect we need to calculate the ratios daily to even stand a chance of analysing it. On the surface, nothing has changed, but just like a swan, there is an awful lot going on under the surface. If the SPX’s was impressive activity then here even more so, which underlines the peculiarity of the situation as the ratios are unchanged. Although, 23900 is only fractionally below the threshold of R3. And, 24300 to 24600 has started to look like it might just be making a play to being the next zone, but still very early days. However, our main point of interest was this index’s flight down to its zone on the very first day of this expiry, managing an impressive 100-point bounce off its bottom boundary just to highlight this. Then, the 400-point opening gap down on the Tuesday changed the whole picture, on top of which the holidays have muddied the waters even further, but we can’t help get the feeling that the DJX really wants the safety and comfort of its zone, but whether the huge recent activity is going to achieve this, or has other anticipations, it is just too early to tell.